All windows and wheelhouse doors double glazed. 2 x one metre Velux double glazed roof hatches with rain sensors for automatic closing. Central heating and wood burning heater. 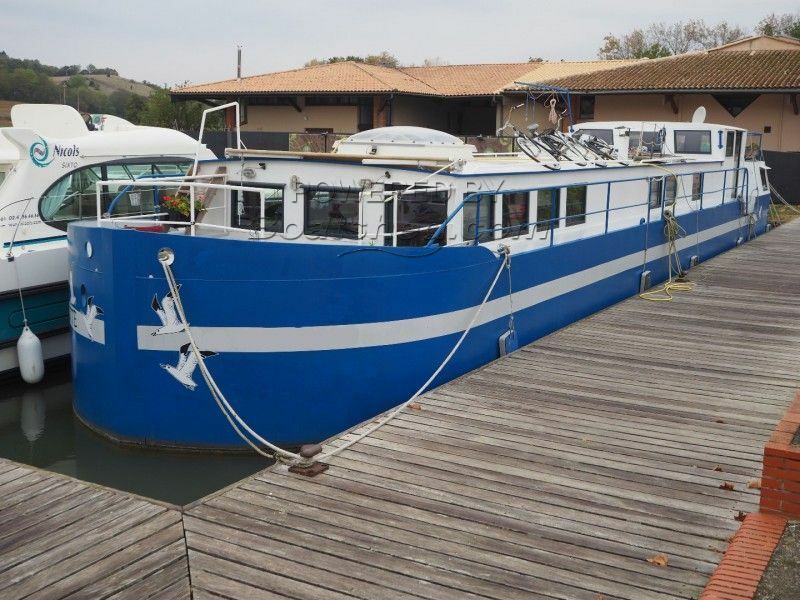 French manufactured barge moored in the south of France on the Canal du midi. The interior has been designed and fitted out to a high standard by the owner and is comfortable, spacious and very light due to large double-glazed windows throughout. Large open plan saloon, galley and dining area incorporating a modern wood burning heater. Two double cabins with en-suite bathrooms makes this an ideal live aboard barge for two with excellent guest or b&b accommodation. For more information or organise a visit, please contact Graham WHARMBY, your local broker at Boatshed MidiCanals. This Peniche KORRYGANE Live Aboard All Year Round has been personally photographed and viewed by James Hebden of Boatshed Midi Canals. Click here for contact details.